The Scan Man has a library full of great websites for people who love document archiving and history. I get a daily dose of history from the National Archives Today’s Document website. These are a few samples, but it’s worth adding bookmarking the site, or “liking” their Facebook page. When musician Pasquale Taraffo applied for a visa, he had to supply evidence of his abilities. 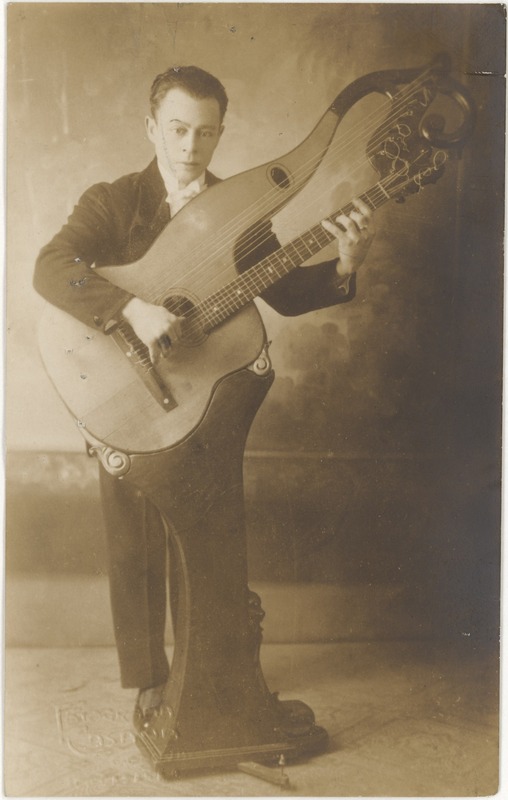 This photograph of Taraffo playing the harp guitar was found in a folder in the National Archives. Born in Genoa, Italy, in 1887, the musician began giving guitar concerts at age nine. He eventually switched from the traditional guitar to the harp guitar, a 14-string instrument mounted on a pedestal. Taraffo started touring abroad in 1910, performing on his own and with other musicians. Known as “the Paganini of the guitar”—a reference to the legendary Italian violinist—he was wildly popular around the world and especially in South America. Happy Birthday, Ernest Hemingway! (July 21, 1899 – July 2, 1961) Photograph of Ernest Hemingway with his son John Hadley Nicanor (Bumby).